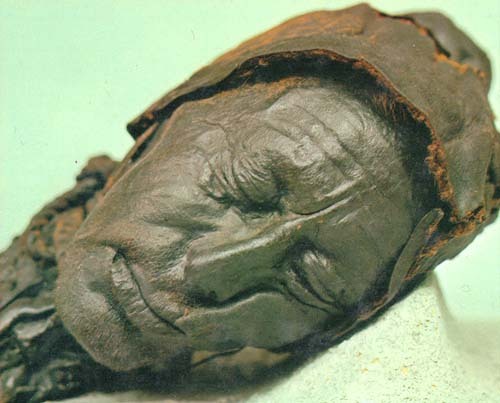 I put a bog body image in my last post (like you do…). 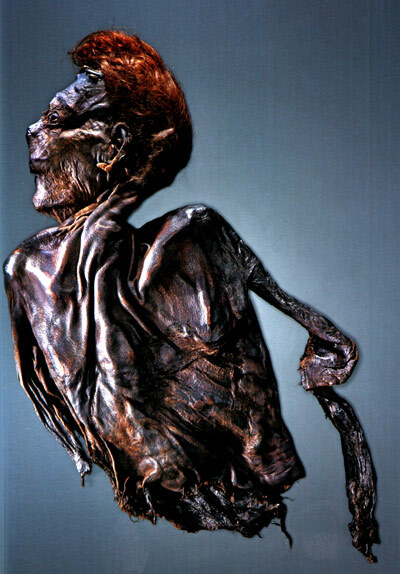 I am fascinated with the preservation of bodies. 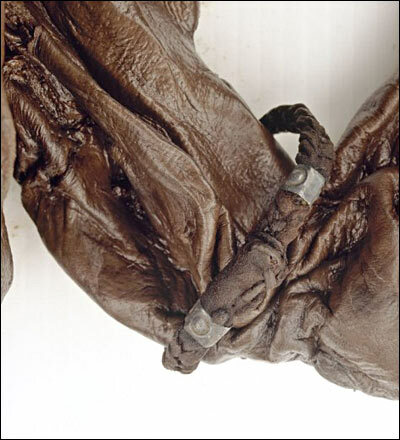 I was lucky enough to see Lindow Man (or Pete Moss as he is affectionately called) in Manchester Museum not long after he was found and couldn’t get over how small he was!. 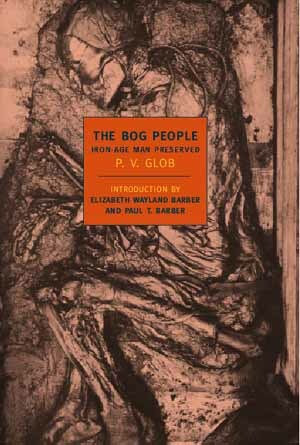 I have been interested in bog bodies ever since reading Professor P V Glob’s books in the 1970s. 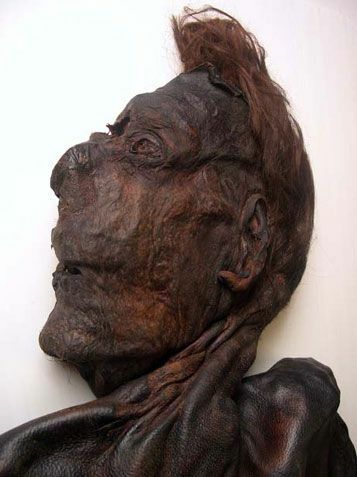 I never knew such mummies even existed. At first I was just curious and a little repulsed by them. But as I read more about them, I began become feel a kind of kinship with these men and women who inhabited a world alien to me now (who really knows if we have lived before, or if there is such a thing as collective consciousness?). I’d like to think so. The harsh existence these people faced: the Gods they worshipped – the very frailties of their lives. The clues are all there. 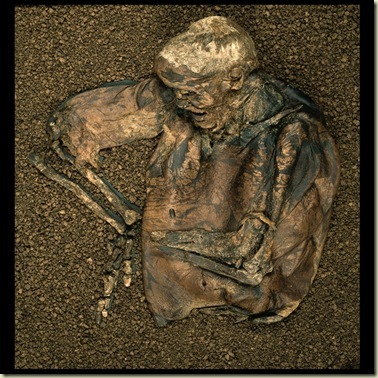 Even the food they ate and what season they died in has been discovered through their autopsies. 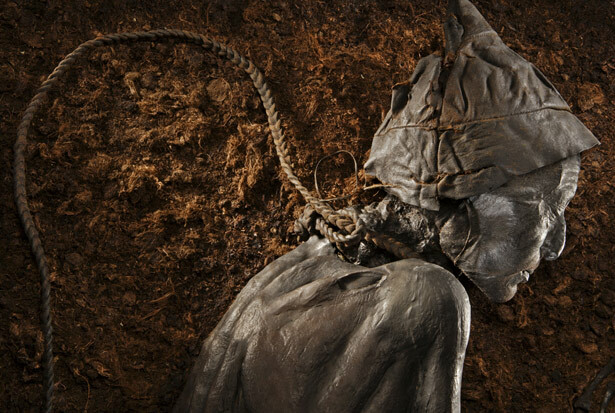 Amongst my favorite bog bodies is the Tollund man. 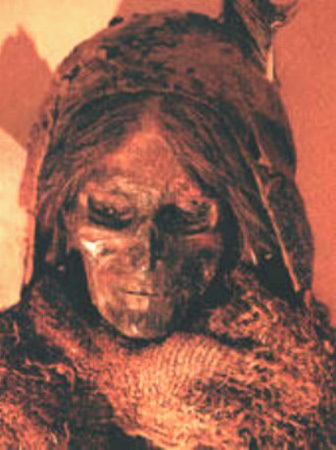 he is preserved and displayed in the Silkeborg Museum. How I would love to see him! The tranquil look on his ‘sleeping’ face belies the hideous leather garrote twisted into his neck. even his leather cap is a work of art, the tiny stitches still being visible from 400BC! the stubble on his chin, his beautiful fingerprints (which have been taken) are things of wonder. 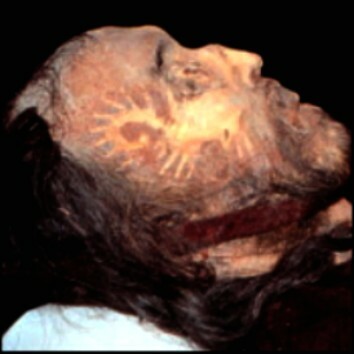 Even the pores of his skin are visible, though the rest of his body has disintegrated. 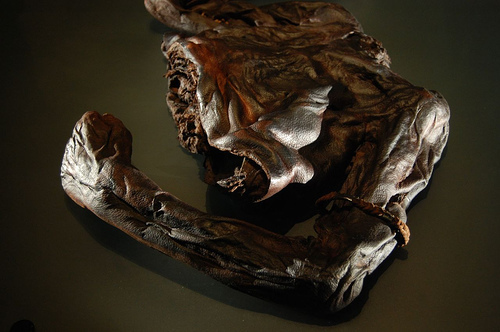 The man was found in the foetal position, naked except for his hat and hide belt.It is the acid in the peat that preserves these bodies. Unfortunately some them have been lost or have been damaged by the peat cutter. It is indeed amazing how these silent sentinels offer up their secrets. It’s even more miraculous that we have the technology to understand our past! What a remarkable place! What a remarkable man, son of a Bricklayer (b. 1753) Sir John Soane, Architect turned out to be! 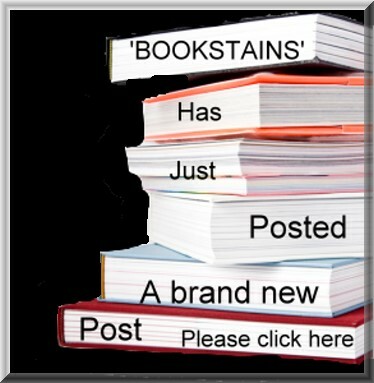 There are also drawings, prints, furniture, clocks and of course books … the list is endless! What a great time Soane must have had collecting them all. He was continually building on and altering his house in order to accommodate this collection. The place must have been in a perpetual flux, forever changing. Soane wanted to preserve his collection to inform and educate students and amateurs. He negotiated an Act of Parliament in 1833 to preserve his house and collection to benefit others. This Act came into being when Soane died in 1837. The public were encouraged to ‘consult, inspect and benefit’ from these collections and they do. Minimal changes have been made to the collections layout. Each Curator has tried to maintain Soane’s wishes regarding Soane’s arrangements. and one my Favourite Goddess incarnations: Diana of Ephesus Turkey. I went to Ephesus in Turkey last year: an amazing place: like stepping back into biblical times. An exhibition of the Adam Brothers drawings of the Grand Tour (Rome). These drawings are exquisite, showing meticulous draughtsmanship. The exhibition runs until 14 February 2009. The paintings, including the ‘Soane’s Hogarth’s’ read like a National Gallery Guidebook. Turner, Canaletto, Reynolds, Fuseli, amongst many. ‘When do they come back? The image on the page is a ‘Spirit’ photo with a ‘Spirit’ standing at the back. The woman who looks like she has a tablecloth in her mouth is actually emitting ectoplasm: a fascinating substance that seems to have died out now in Spiritual circles. 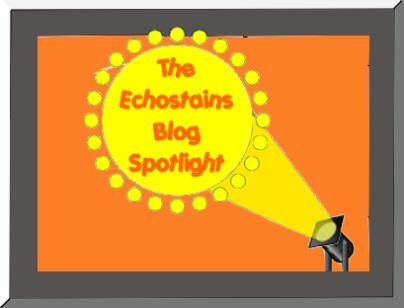 This ectoplasm eventually gave form to a spirit or so they say, though I’ve yet to hear a spirit confirm this. The spirit world seems to have moved on now: it’s all mod cons now: orbs are the new phenomena. Transformation of communication again. Life and Death are fascinating questions (or are they both statements: facts?). What IS life? And what exactly IS death? We know that there IS Life (well, as we know it), but what is death? Is there life after death? Perhaps there’s no death, only a kind of life that goes on and on. 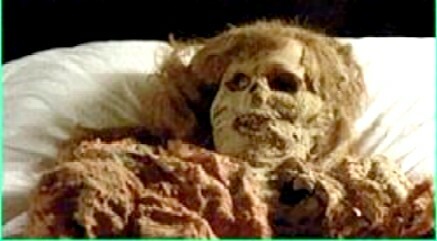 I have always been extremely interested in the preservation of dead bodies. That’s probably due to a subconscious yearning for Everlasting life . In that sense, I am no different from an ancient Egyptian. or preserved in watery bogs. It is the preservation of the body (and the soul) that interests me. It was for one of those reasons I went to see Professor Gunther von Hagens ‘Bodyworlds’ exhibition when it came to Brick Lane London in 2002. Von Hagens, known as the ‘Plastinater’ (I shook hands with that charming man by the way; his hands were cool…) had called into the exhibition to give an interview to a TV station. There was also red paint (that at first looked like blood) on some of the backstairs: some kind of a demonstration protest had taken place. My husband wasn’t keen on going to this exhibition, but even he thought it was fantastic. We didn’t find it morbid or grisly though, though it’s hard to get away from the fact that these are dead people. Some of them are celebrating things they did in real life. The professor is no artist though and some of the tableaux could be said to be in bad taste. I think his attempt to ‘lighten’ what is a controversial subject matter, may have backfired somewhat. But I do think that his intentions were honourable and he really wanted to show how these body parts worked and what went wrong when they didn’t. It’s not often that we see exactly what a deceased lung looks like…or a brain haemorrhage, yet these and other illnesses kill us. When I looked at these illnesses, I felt that I was looking death in the face (the causes of death) and that the ‘mystery’ had gone: the machine had broken: here’s what has broken it. 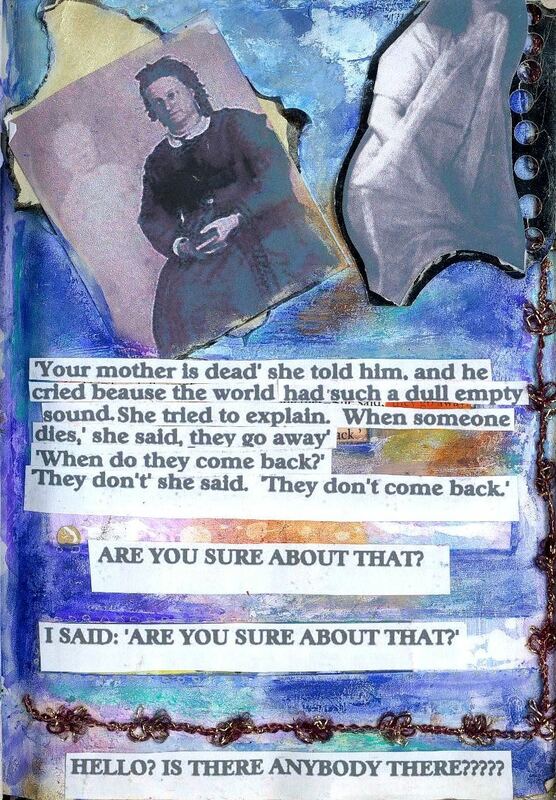 I gazed in wonder at these dead people who looked back at me. They were just like me: the same species. Only they were dead and I was Alive, looking at them: looking at these fantastic, miraculous machines – because machines we are: I couldn’t help but be acutely aware of the ONE difference between me and them: the spark of Life which I hold within myself. For that reason I found the exhibition a super Life affirming experience. Life affirming! Not death affirming, that’s inevitable. This leads onto the other question though: is there life after death? Well if there is, we sure don’t need the body to live it. In that way, that’s where the Ancients went wrong, they thought the soul was nothing without the body it inhabited. 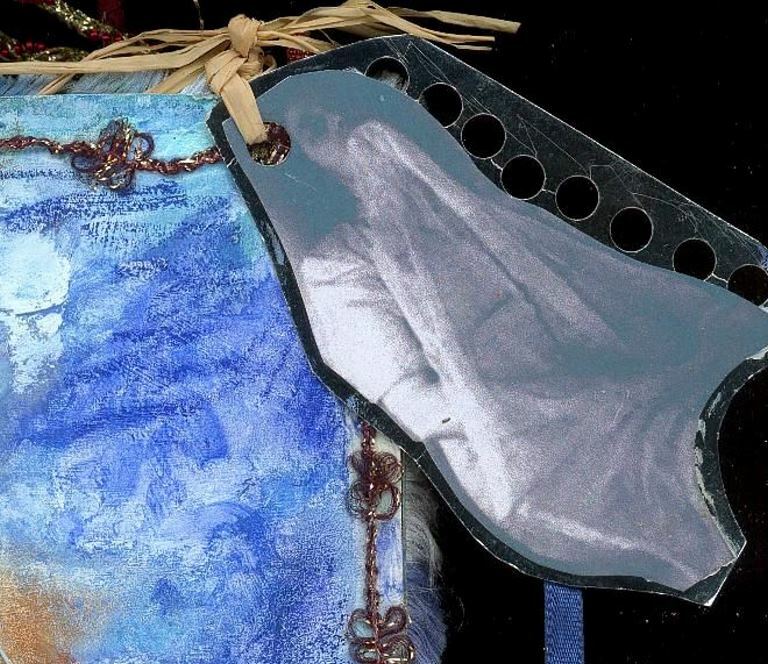 At University, in the Foundation years I came across an artist that dealt with the spirit world. This man claimed that he communicated with the dead and transmuted their communication through his art. Austin O Spare dealt with the subconscious. 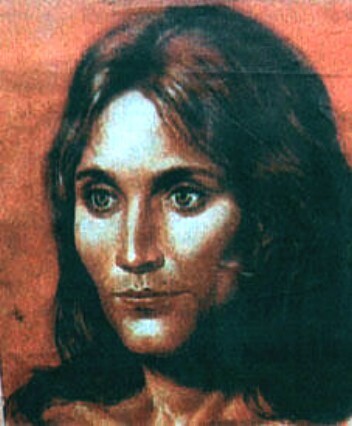 O Spare who was very interested in the Occult and Ancient Magic claimed that some of his brushstrokes were directed by spirits: those who inhabited the Spiritual realm and that his art was automatical, springing from the subconscious. I wrote an essay about this that I will put on this blog called ‘Art and Subconscious’. O Spare was one of the artists I used in my research. I first came across O Spare in an article in the Fortean Times (lots of interesting and thought provoking stuff in this magazine). 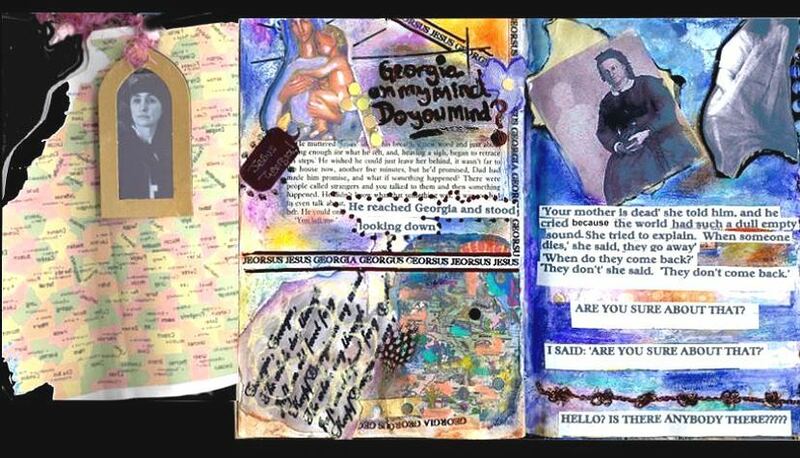 “In some cases the ideas are the result of my inward psychical experiences,” Mr. Spare told me, “things I have not necessarily seen, or outwardly experienced. In others, the drawings are automatic, started with no idea as to what form they shall take, and completed without conscious direction.